There's a lot of head scratching going on in the great white north as fans, pundits and administrators wonder where it's gone wrong in their men's XVs program. They recently qualified for the 2019 World Cup through the last avenue possible, the repechage. Canada have always gone through door #1 into the World Cup since its inception in 1987. Canada always won the North American title defeating USA, USA would then win the Americas playoff by beating Uruguay and Uruguay would get in through the last avenue. Not this World Cup cycle, USA won the North American title, Uruguay defeated Canada in the Americas playoff and Canada went through in the repechage. Why is the question. First let's look at some raw data. The first is the yearly head to head competition between Canada and USA since 1977. These are the point spreads per year in matches between Canada and USA. If it's red then Canada won, if it's blue then USA won that year. There's a lot of red up until the 2013/14 season, then it went all blue. 2006 was a good year for Canada with a 60+ point spread in matches, 2017 was a good year for USA with a 50+ point spread. 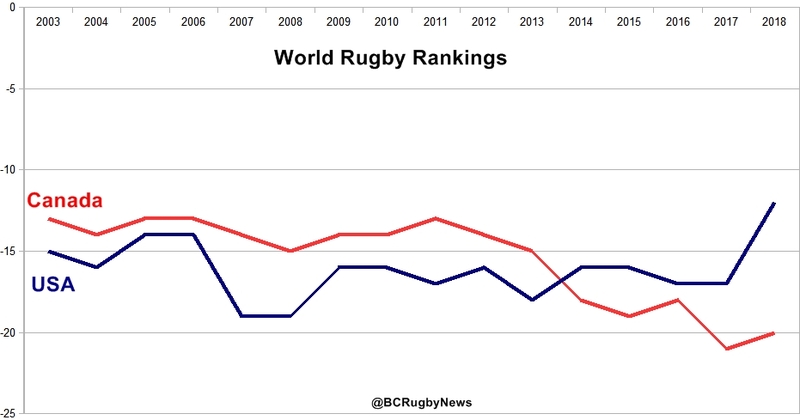 Next let's look at the World Rankings since 2003, the date they're archived on the World Rugby site. Canada have always ranked ahead of the USA, again until that pivotal 2013/14 season when the lines crossed for the first time and have expanded since. Here's the same graph with the Canadian coaches. 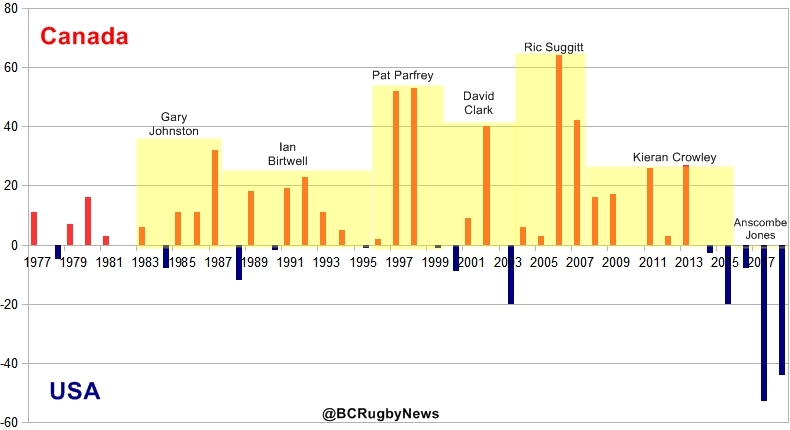 The 2003 to 2007 cycle was Ric Suggitt's, he kept it fairly even keel with a slight dip after the 2007 RWC. Kieran Crowley came in and raised it in his 1st term to the level that Suggitt had inherited from David Clark at the 2003 World Cup. 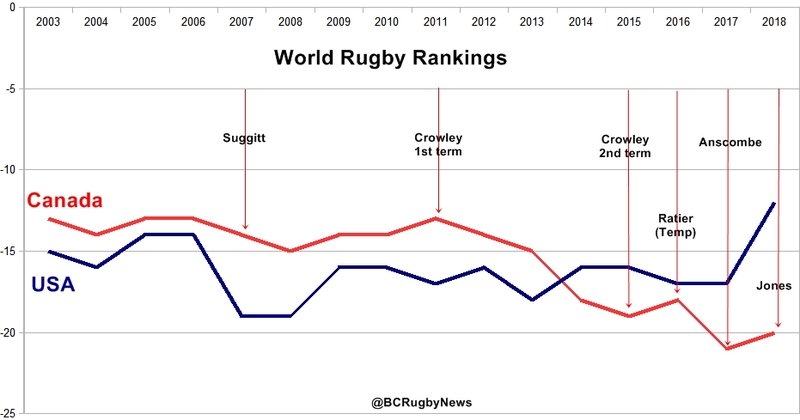 In Crowley's 2nd term however, things went terribly wrong and it's where USA went past Canada in the rankings. Crowley left and Francois Ratier brought Canada briefly up during his temporary assignment as National Men's coach. Mark Anscombe was brought on board and the chart plumetted quickly, Kingsley Jones has made a modest recovery during his time at the helm. The USA have soared in the meantime and the gap is greater than it has ever been. Here's the same coaching overlay on the head to head results going back to the first World Cup in 1987. Gary Johnston was the first coach and only had one losing year to the USA. Ian Birtwell did a double term and had 3 losing years out of 8, 2 of them being his first and last year. Two of the losses were by the smallest of margins. Pat Parfrey took over and the wins became bigger, 50+ two years in a row. David Clark took over and had mixed results splitting his four year term, losing the first and last year but maintaining wins in between. Then Ric Suggitt became coach and won all four years including the biggest wins in 2006. Kieran Crowley did a double term, his 1st term was perfect but his 2nd term is where the switch occurred which is part of the current trend. Canada haven't beaten the USA since 2013 and Mark Anscombe and currently Kingsley Jones are part of that RWC cycle. The final graph looks at some of the structural changes during that time period. 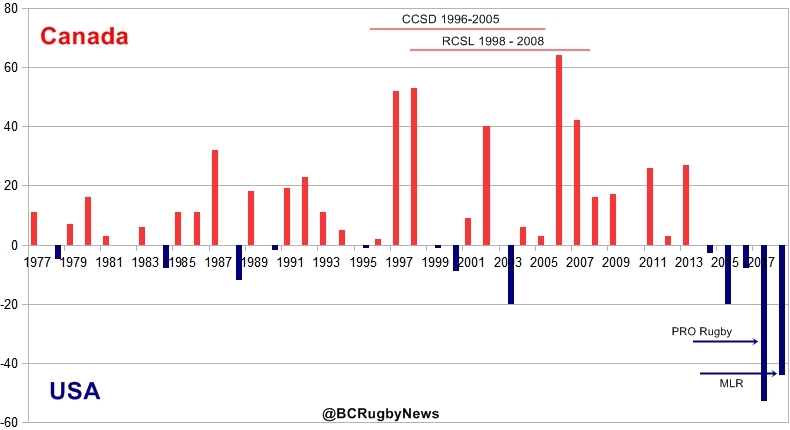 In Canada the CCSD U23 Centralized Development program (also known as Pacific Pride) and the RCSL (Rugby Canada Super League) were active during some of Canada's top years in terms of results vs USA. In recent years the advent of PRO Rugby (2017) and MLR (2018) have coincided with the USA's top performance years. Each person looking at the data will draw different conclusions, we'll present our views here, feel free to share your thoughts in the comments section. First a word of caution on the view that MLR will solve Canada's problems. If Canada duplicates everything the USA does, expect the USA to come out several times better simply due to their size differential which population-wise is 10 times greater. Canada can't expect to mimic USA and surpass it, Canada needs to develop strategies that are customized to its strengths. A simple observation, when RCSL operated it was the top league in North America. 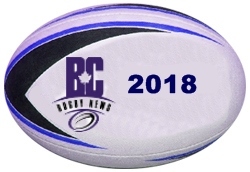 It was focused on regional rugby and had buy in from some of the Canadian big hitters like Pat Parfrey in Newfoundland and Karl Fix in Saskatchewan. Vancouver Island was committed at the beginning and won four titles. It was a decent semi-pro competition, the best there was at the national level, at the time. The BC Premier was doing well during that period as well as it became the unofficial winter league in Canada and anyone wanting to play national team would be in BC in the winter and RCSL in the summer. Now MLR has become the top league in North America and it has accelerated the USA winning margins and their World Rankings, its predecessor PRO Rugby played a role in that improvement as well. This is perhaps the one area that Canada can set the standard in North America, it's something they had, lost it and now are trying to bring it back. A centralized U23 development program. If Canada can improve it's U20 ranking and make it a goal to make Tier 1 and stay there, the senior results will follow. Thinking that having one Canadian team in MLR compared to eight USA teams is going to be the solution to regaining parity is wishful thinking. Canada needs to do more and a centralized program focused on the U20 and early 20s players seems a good start. As Jono would say, "just one man's opinion".